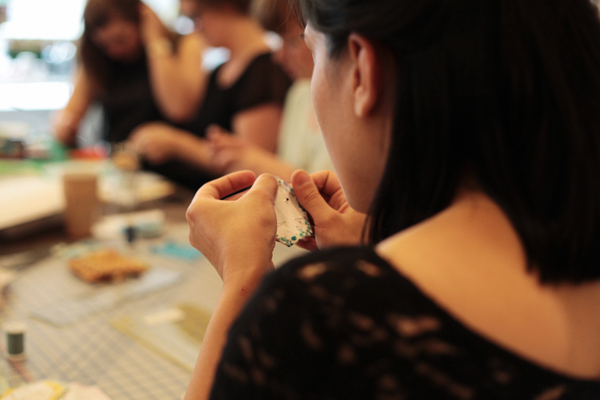 beehive craft collective: Hexagon Craze! 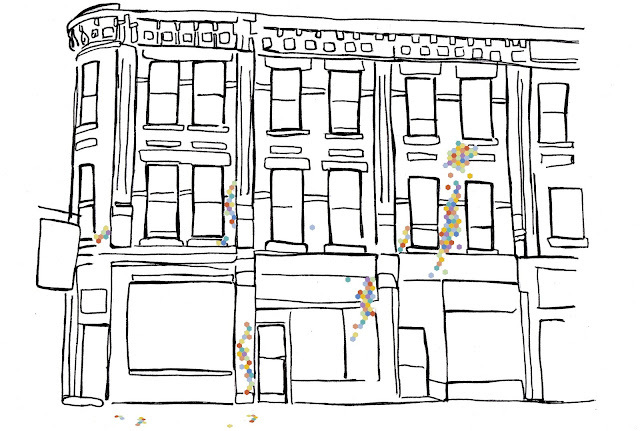 By now you've likely caught wind of our big plans for a Beehive installation at this year's Supercrawl! Our piece is called Modular Beauty and will be made up of hand-sewn, English paper pieced hexagons that will creep and grow out of unexpected places along James Street, mimicking hives in the wild. You'll remember that last year the Beehive installed a large-scale art project onto the facade of The Brain, which was the collaborative effort of many, many helping hands. This year we’re back at it with another idea, and community contributions to this installation are not only in the spirit of the project - which celebrates the culmination of multiple efforts to make something beautiful - they are also totally essential to making this whole thing a success! After we explained the project a few weeks ago, and let you know that we were looking for lots and lots of hands to contribute, the project picked up steam and we have a lot of interest - which is so great! We hope you’ll consider joining in on our Hive Drive campaign to generate a serious crop of hexagon clusters, allowing us to expand this fibre intervention as much as possible over the buildings of James Street North. 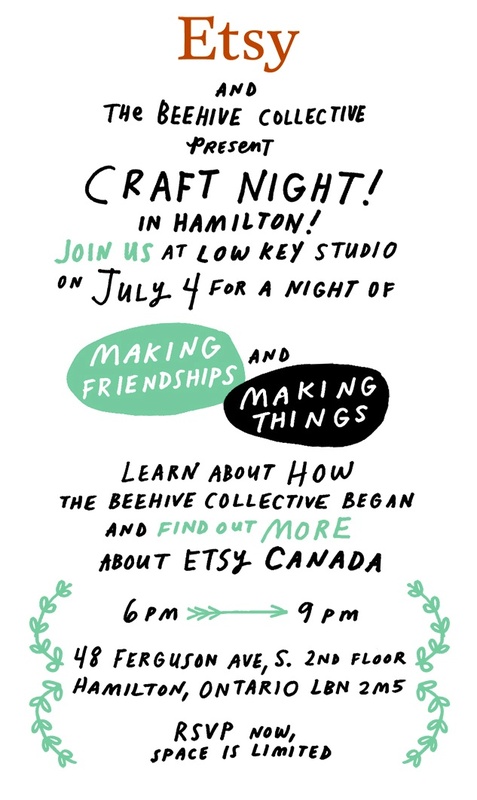 In partnership with Etsy Canada we are hosting a Hive Drive hexagon-making party on Wednesday July 4 from 6:00-9:00 (that's next week!). We are so excited to invite you to join us at Low Key Studio (an amazing loft space/artist-run photography studio & art showcase gallery located at 48 Ferguson Ave. S. in Hamilton) for a night of relaxed hexagon making. Zero experience necessary – it is a very simple craft and we’d love to show you the ropes. And trust us, once you start making these little cuties, you won’t be able to stop! We’ll provide the fabric, templates and supplies (though of course feel free to bring your own) as well as refreshments and treats. It’s gonna be a super fun night so bring friends or come on your own and meet other crafty locals! RSVP here! Can’t make the July 4th Hive Drive or planning on making hexagons at home? We have several super-duper hive drive donation locations throughout Hamilton supporting the cause. At these locations, starting this weekend (June 30th), you can pick up hexagon templates and fabric scraps, and drop off sewn hive sections when completed. If you have some fabric you’d be willing to donate towards hexagon making, we’ll gladly accept it through these locations. Anything you can contribute is MUCH appreciated! The Ship – 23 Augusta St.
Central Branch – 55 York Blvd. Terryberry Branch – 100 Mohawk Rd. W.
Sherwood Branch - 467 Upper Ottawa St.
Citizen Kid – 188 Locke St. S.
Cake and Loaf – 321 Dundurn St. S.
The Baltimore House – 43 King William St. 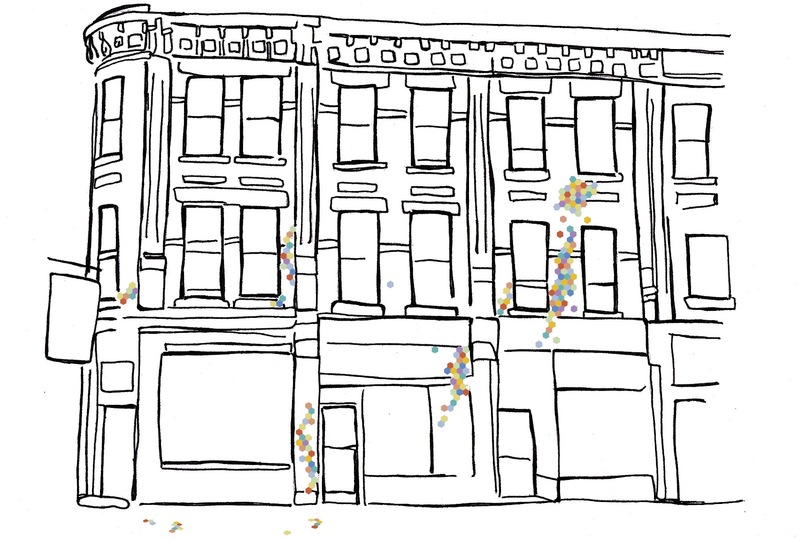 Kid Icarus – 75 Nassau St.
Russet & Empire – 390 Keele St. The Arthur - 550 College St. If you're not in our city and would still like to contribute, please do! You can pop those hexagons in the mail and address them to Needlework at 174 James Street North Hamilton, ON L8R 2L1. We must receive them by August 17th 2012 to make sure that we have enough time to work them into the larger piece. Lastly, if you plan to make a bunch of hexagons at home, and you're looking for some tips, we've put together a short and simple set of instructions for you. Here we go! 1. Start by cutting out a number of templates. You can find the download links on the sidebar of the blog. It's not a bad idea to punch a hole or two in each of your hexagons, as this makes removal of the paper templates easier later on. 2. Pin your paper hexagons to the wrong side of the fabric, ensuring that there is a border of at least 1/4'' on all sides. 3. Cut the fabric pieces out, adding about 1/4'' to the dimensions of the template. This will result in hexagons that are 1/4'' bigger than the paper template on all sides. 4. The next step is to baste the fabric around the paper template. The basting stitch is a long running stitch that is used for temporarily holding the fabric in place. First thread a needle with a long piece of thread, and knot the end of it. Fold an edge of the fabric over one of the sides of the hexagon template, and stitch through the corner. Fold the next corner and repeat. You can carry the thread from corner to corner, there is no need to knot it and start again. Keep the corners clean and crisp. 5. Repeat these steps a million times over to make a million more hexagons! 6. 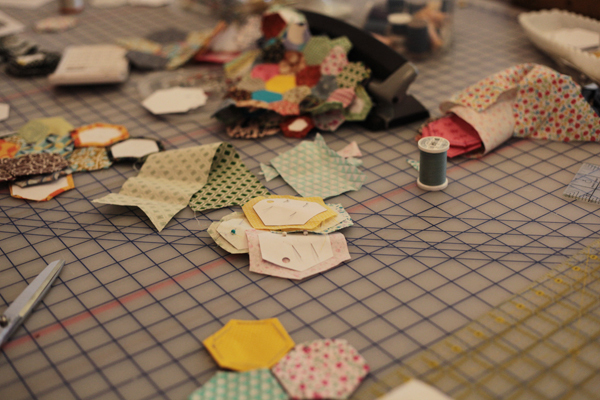 Once you have a few hexagons basted and ready to go, it’s time to start piecing them! Take two hexagons and place them right sides together. Whipstitch the two pieces together along one edge. Stitch as close to the edge as possible, only picking up a few threads of the fabric each time. Be careful not to accidentally sew through the paper. Continue to add pieces, whipstitching them together along adjacent edges as you go. 7. When you've joined together all of you hexagons, you can give them a quick press with an iron then remove your basting stitches. Now you can carefully pull out all of your paper hexagons, et voila! You are finished! Yay! Congrats! If you have any questions about the tutorial or Hive Drive, don’t be shy to get in touch at beehivecraftcollective@gmail.com. 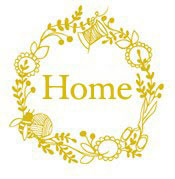 The Beehive is a craft and urban homesteading collective. 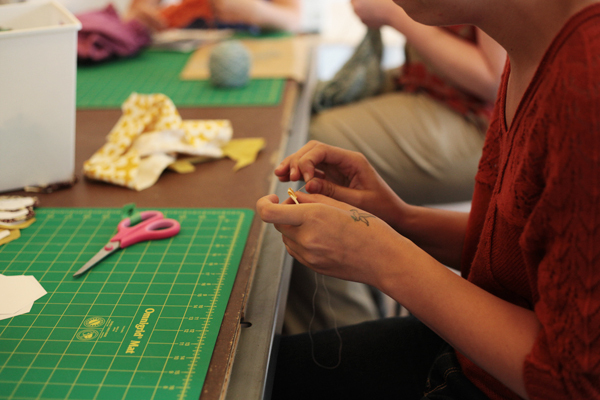 Bound together by a common thread of making things by hand, this collective was formed in 2011 by members of the arts community in Hamilton, Ontario. Focusing on handmade, DIY, and sustainability, we hope to engage and promote a lifestyle of creativity and self-sufficiency.